Mr. Jim Fox (far right) pictured with his El Dorado High School cabinetry students, Trustees, and Dr. Greg Plutko. Mr. Fox was presented the "You Are The Advantage" award on February 5, 2019. 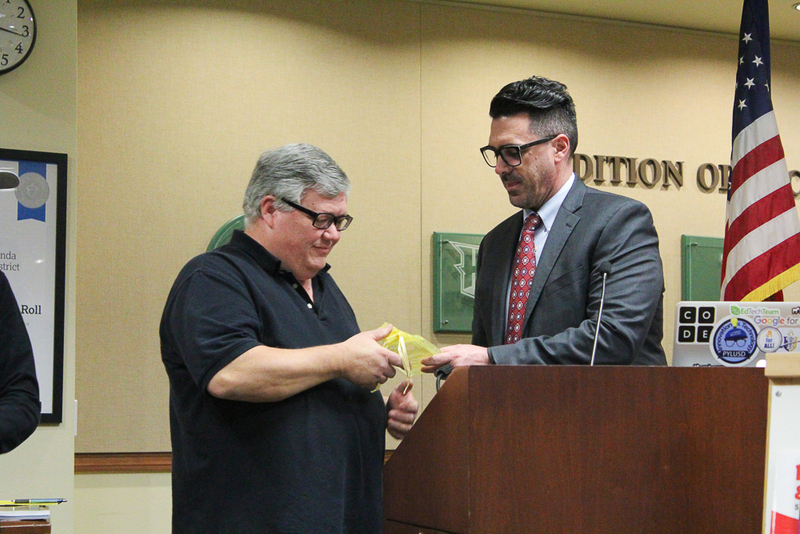 On Tuesday, February 5, 2019, the Placentia-Yorba Linda Unified School District (PYLUSD) Board of Education honored longtime El Dorado High School (EDHS) cabinetry teacher, Jim Fox, with the “You Are The Advantage” award. This award recognizes community members, organizations, and employees who embody the District’s four core values – excellence, collaboration, integrity, and innovation. 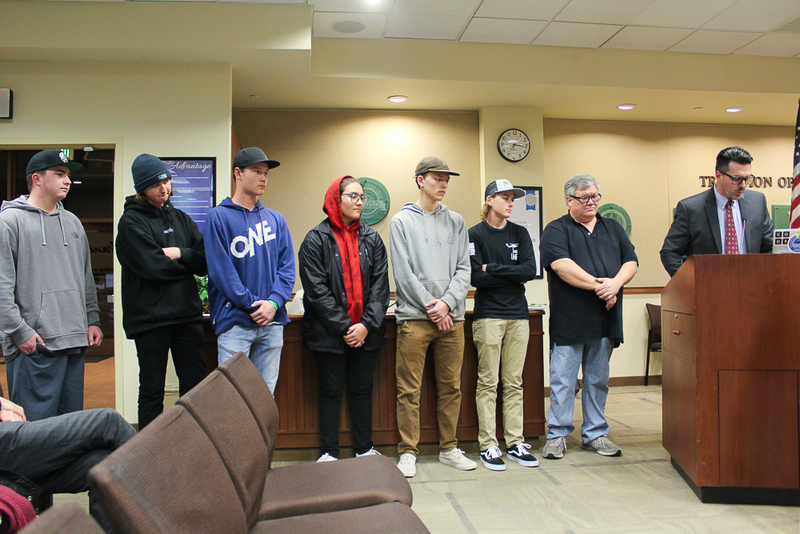 Under the direction of Mr. Fox, EDHS cabinetry students were recently tasked with an important project in benefit of PYLUSD students and classrooms. The Golden Hawks were asked to design and create more than 60 big book easels for kindergarten and first grade classes district-wide. These easels often serve as an essential part of any elementary school classroom, providing an easy read-along book display shelf and an upright surface for students to write and draw on. Once the District learned that many classrooms were in need of big book holders to support new learning materials, but also of how costly they are to purchase, they enlisted Mr. Fox’s expertise. Mr. Cary Johnson presenting Jim Fox with the You Are The Advantage award. “Mr. 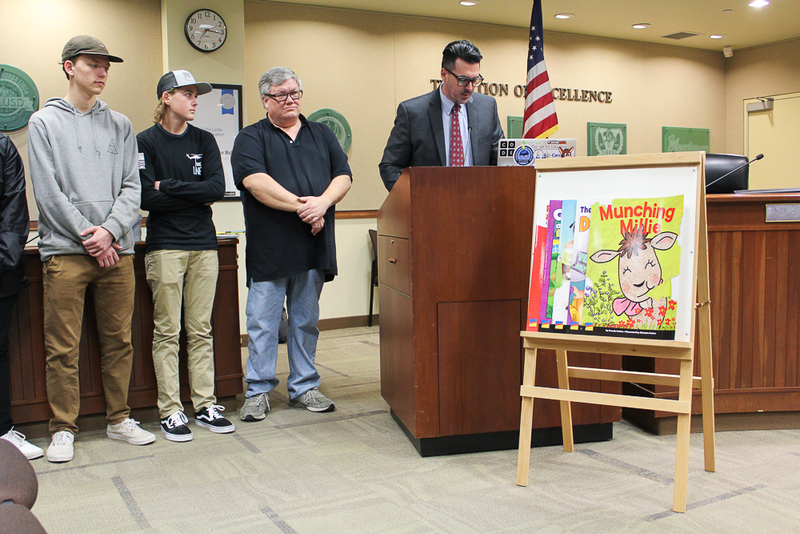 Fox saw an opportunity instead of an obstacle by producing a well-made easel for our elementary schools and providing a work-based learning opportunity for his El Dorado cabinetry students,” said Cary Johnson, Director of K-12 Innovation and Technology, at the Board Meeting. Six cabinetry students were also in attendance that evening to help celebrate Mr. Fox’s accomplishment including Joshua O’Neal, Chris Schaner Fink, Nicholas Woznichak, Logan Harrington, Kyle Willerford, and Victor Vasquez. They are just a few of the Golden Hawks responsible for crafting the big book easel order. The District truly appreciates Mr. Fox’s inventiveness and continued support, and congratulates him and all of El Dorado High School on this award! Thank you, Mr. Fox! Be the first to comment on "El Dorado teacher Jim Fox honored with “You Are The Advantage” award"